"This picture is of the schwimmer with all the parts inside, this was the day I bought the sch'm, (great day)." 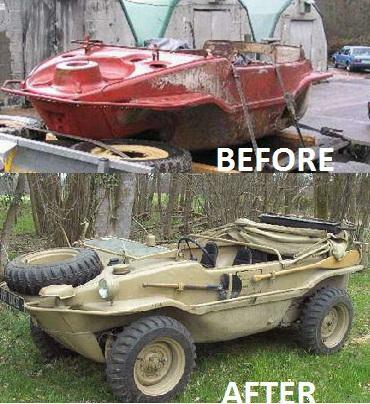 "As for my schwimmwagen it is finished. I am still missing the hood but I have tracked one down for a fair price. I was missing the fuel tanks but I made two, there not orignal but they will do the job and the drive from the engine to the body for the propeller is missing but I managed to find one to copy so I'm making one assembly at the moment so it wont be long before its going into the water!! When I say its finished, I still have some work to do but it drives, all the electrics work and it has just passed the British MOT, all I have to do now is register the schwimmer with the DVLA, (Give it a UK number plate) and I'm on the road!!" "I have the certificate from wolfsburg and it was built on the 31/12/1943 and left the factory on 5/1/1944 and went to Erfurt. The chassis number is 7008777, body number on the engine lid hinge is 8188.